Days after Donald Trump’s chief of staff, John Kelly, allegedly warned Environmental Protection Agency head Scott Pruitt to knock it off with all these goddamn scandals, the Associated Press reports that the full bill for the first year of Pruitt’s unprecedented travel and security expenses are now in the neighborhood of $3 million. Shortly after arriving in Washington, Pruitt demoted the career staff member heading his security detail and replaced him with EPA Senior Special Agent Pasquale “Nino” Perrotta, a former Secret Service agent who operates a private security company. The EPA official knowledgeable about Pruitt’s security spending says Perrotta oversaw a rapid expansion of the EPA chief’s security detail to accommodate guarding him day and night, even on family vacations and when Pruitt was home in Oklahoma. Perrotta also signed off on new procedures that let Pruitt fly first-class on commercial airliners, with the security chief typically sitting next to him with other security staff farther back in the plane. Pruitt’s premium status gave him and his security chief access to VIP airport lounges. 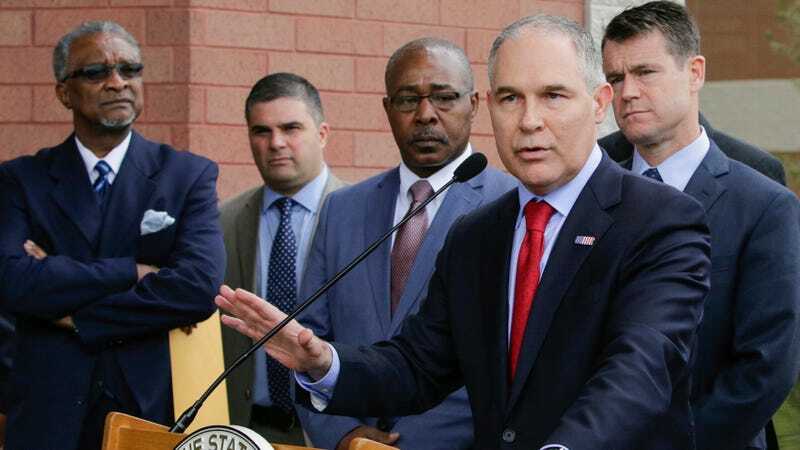 A nationwide search of state and federal court records by AP found no case where anyone has been arrested or charged with threatening Pruitt. EPA’s press office did not respond Friday to provide details of any specific threats or arrests. Days ago the New York Times reported at least five officials at the EPA were “reassigned or demoted, or requested new jobs” in the past year after questioning these and other expenses like lavish office furniture. Three current and former EPA staff told the Times that security official Eric Weese ran afoul of Pruitt for unsuccessfully trying to put a stop to his use of motorcade sirens and lights to bypass DC traffic. Weese was allegedly demoted even as Pruitt used the motorcade to go to Le Diplomate, a fancy French restaurant in DC. Other controversies have included Pruitt renting an apartment from an energy lobbyist at below market rates, defying the White House to give staff huge pay raises, and dodging normal congressional review procedures to stack positions at the agency with industry flacks. All of these questionable expenses are mounting at the same time Pruitt has promised to implement a folksy-sounding “back to basics” agenda at the EPA. Back to basics is apparently slang for rolling back the agency’s regulatory efforts and firing hordes of staff and scientists. This is totally in sync with the White House, which in its last budget proposal sought $2.3 billion in cuts to the agency (including reducing hazardous site cleanup by 45 percent and phasing out environmental justice programs). According to Axios, the Trump administration sought even deeper cuts. It’s unclear what this means for Pruitt. Myriad reports have variously suggested White House aides are growing frustrated at reports he’s used EPA funds to treat himself to a luxurious lifestyle, or that the president is just fine with it since Pruitt is quickly enacting his agenda. On Friday, CNN reports, press secretary Sarah Huckabee Sanders told journalists that the president believes Pruitt had “restored [the EPA] back to its original purpose of protecting the environment”—an obvious lie, but one seemingly calculated to give Pruitt cover. Unfortunately, most of the candidates to replace Pruitt are at least as bad or worse.